This is a book of stories that I've experienced -- behind the scenes of televising some of the most challenging sporting events in America that are seen around the WORLD. These are a collection of stories - from my perspective - of the things that go wrong behind the scenes, and the things that we do to fix the issues, and some the solutions that we come up with. WAIT - everyone in the country is watching, and you're not allowed to make mistakes... No Pressure! You might remember this from the World Series Game 1 in Kansas City on October 27, 2015. I was there... working with a very talented crew of technicians, producers, directors, technical producers, electricians, and engineers that solved this problem. This book will include that story, and many others just like it. Please remember - these stories are from my perspective. If you were one of the crew members on that show, please post your story - from your perspective - on our Blog, we would love to hear your side of the story. I've worked with Matt Benedict for over 25 years. He is the consummate professional. His vast production experience, organizational skills and attention to detail make him the ideal candidate to author a true behind the scenes compilation. 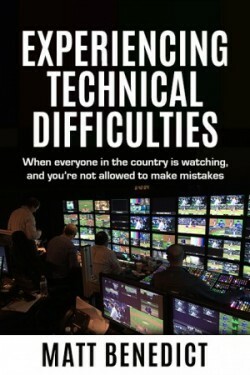 His new book "Experiencing Technical Difficulties" is a great depiction of what actually goes on in the otherwise unseen world of Sports Television. This promises to be a good read. Matt is one of the best in our business, He knows the ins and outs for Remote Television Production. The information is this book is an enjoyable look into a tough, yet fun business. Matt is one that knows Prior Planning Prevents Problems. "I had the privilege of reading Matt's book about all of the difficulties that can be associated with doing sporting events live! The world does not know the manpower, hours of preparation and work that it takes to get a live event of any kind on the air without any major difficulties. I enjoyed reading Matt's stories about the ways that he and his crew pulled together to solve issues and avoid disasters. Thank you, Matt, for putting these stories down on paper for other to read!" I've been there! As someone who has shared one or two of these stories with Mr. Benedict I can assure you that these kind of things happen – all too often. The complexity of modern live television sports broadcasting is something most consumers are not aware. In "Experiencing Technical Difficulties" you get a chance to share in some of the sometimes heart stopping situations that occur behind-the-scenes of a live sports broadcast. Mr. Benedict has combined his years of experience in the sports broadcasting to bring you these stories, all designed to protect the innocent. It's like someone in the CIA sharing top- secret projects but not being allowed to say who's who. Unlike most books, this one has a continuing lifecycle with its connection to the blog. The blog adds insight and stories from those involved for different perspectives on these stories and new stories not in the book. If you have anything to do with live television, or are considering a career in the business then this book is a must. With this book you can't say you didn't know what you were getting into! Wow! It sure is a different world behind the scenes. While the rest of us are watching the game, Matt and the crew is waging their own battles in what is a weekly pressure cooker. Matt, I love how you put us right there – I felt my stress increasing a bit with every “down to the wire” problem solving. A must read for any sports fan – there is a game behind the game for the guys putting on the show every week. Only available on this website as a downloadable .PDF document! © Copyright 2018 Flamma Energy Corp.